CHURCH DOCUMENTS from the first few centuries give us glimpses of what women could and could not do. But what were the controversies that made these rules necessary? Antiquities scholar Karen Torjesen traces the development of the church orders, and considers their social subtext. Those Eccleiastical traditions which have not yet recognized the legitimacy of women’s leadership see themselves as keeping faith with an ancient tradition that explicitly rejected the leadership of women in the church. Their appeal to tradition is largely an appeal to a series of documents called the church orders, which span five centuries. These church orders, claiming apostolic authority, sought to define the liturgical and ecclesiastical practices of the church. However, each of the church orders was composed at a particular point in ecclesiastical history. They convey, in the language they use and the issues they discuss, the particular concerns of the church at that moment. Although their claim to apostolic authority intends to obscure their roots in particular crises of ecclesiastical history, a careful reading can identify the controversies out of which each new church order was formed. The debate over women’s ordination has sparked a number of recent studies of early church orders. Scholarly activity has focused primarily on the types of ministries exercised by women and on the specific nature of their ordination. Scholars have tended to read the church orders exclusively as regulatory documents, excerpting only their authoritative definitions of ritual and practice. But the church orders are more than legal codes. They are treatises composed to settle controversies over liturgy, discipline and ordination. For the historian, it is the polemical contours of these controversies that provide the most reliable knowledge about the practices of the 3rd-, 4th- and 5th-century churches. The so-called “apostolic teachings ” buttress only one side of a dispute. It is the controversies behind them that provide concrete evidence for the practices of the churches of the first five centuries. Most scholars have limited themselves to the question, Do the church orders prescribe ordained ministries for women? 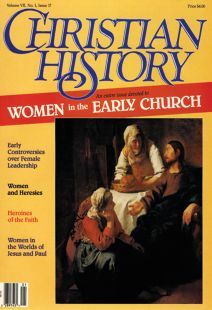 They conclude that, although women had an important role in the Christian community, they exercised no leadership role. On this reading the only offices held by women were those of deaconess and widow. According to these scholars, the office of deaconess did not develop until the 3rd century, and then only in the East. The office of widow, according to these scholars, was never a true office but only a way of life sanctioned by the church for those dependent on her benevolence. However, a different reading of the church orders, one that attempts to reconstruct the conflicting positions rather than recite the imposed settlement, provides a different picture of the practices of the churches in the first four centuries. From this vantage point we see women exercising a variety of ministries—teaching, disciplin, disciplining, moving from house to house, entering into public debates, and speaking in the assemblies. “For our master Jesus Christ sent us, the twelve, to teach all nations, but He did not command the women to teach, nor to speak in the church and address the people .... For there abode with us Mary Magdalene and the sisters of Lazarus, Mary and Martha, and Salome and others along with them, and since he did not command them to teach alongside us, neither is it right for other women to teach ” (Didascalia XV, translated by A. Voobus). It must be pointed out that these “apostolic sayings ” were created in the 3rd century by authors whose intent was to provide lst-century justification for a disputed 3rd-century practice. These “apostolic sayings ” offer a clear statement of the theological justification used for the exclusion of women, but they do not provide insight into the actual motives for the exclusion of women from church offices. Nor do they give a description of the circumstances under which this exclusion seemed necessary. Only a careful study of the controversies that produced—and modified—these documents can provide answers. From the controversies, we learn that women’s ministries raised questions of propriety. Terms such as “immodest, ” “unchaste ” and “shameless ” spice the discussion and phrases such as “on the streets, ” “in public places ” and “in the assembly ” are sounded in scandalized tones. This begins to give us a feel for the underlying reasons for the eventual exclusion of women from these ministries. Further, a diachronical study of the controversies echoing in the church orders will allow us to trace the mutations of the issue of women’s leadership from century to century. By beginning our study with the Didache and progressing chronologically through the Apostolic Tradition, the Didascalia, the Statutes of the Apostles, the Constitutions of the Apostles, the Octateuch of Clement and the Testament of Our Lord, we can follow play-by-play the changing fortunes of women’s leadership. The first document of our series is the enigmatic Didache. While its provisions are quite clear, its period and provenance have never been settled to everyone’s satisfaction. More of a consensus has emerged over the place—Syria or Egypt, than over the period—anywhere from the late 1st century to the early 3rd. According to this church order, the authoritative offices are those of apostle, prophet, and teacher. The function common to all three offices is Spirit-inspired instruction. It is clear that the basis for the authority of those who claim these offices is the possession of the Spirit. Thus it is an authority that is recognized by the church, but not conferred by it. Correspondingly, no rite of ordination is given through which Spirit—inspired persons are installed in their offices. The concerns of the church at this historical moment were those common to groups recognizing charismatic leadership—namely, the problem of credentials. Thus a major section of the Didache is devoted to procedures for distinguishing the true prophets from the false. It is interesting to note that, although one of the major concerns of the Didache is the problem of leadership, the issue of leadership by women is absent. There are no restrictions placed on the ministries of women, nor are there any specifically women’s offices. Later church orders do restrict women to certain roles, but among the writers of the 1st and 2nd centuries grappling with the problems of leaders (Clement and Ignatius, as well as the Didache), we do not find any suggestion that women’s ministries were controversial. The Apostolic Tradition of the early 3rd century presents a new form of church organization, claiming lst-century apostolic authority. The church has changed since the time of the Didache. We see this in the expansion of the doctrine of the Spirit as it relates to leadership roles. The authoritative offices are no longer the teaching offices, but the Eucharistic offices. The Spirit is still the basis for the authority, but now the Spirit is conferred by a specific rite of ordination in a narrowly defined way, and for the exercise of specific functions. In this church order we find the first restrictions placed on women. Widows are not to be ordained. The Apostolic Tradition justifies this on the grounds that widows do not exercise a eucharistic ministry. But the larger context for this restriction is that the particular spiritual gift of authority has been linked to the Eucharistic offices. Not only are widows excluded from the ordinations, but so also are readers, subdeacons, and male and female virgins. The Didascalia, a church order composed around the middle of the 3rd century, is the first church order to reflect a major controversy surrounding women’s leadership. The exhortations on the Christian life in the first section of the church order contain restrictions placed on women in their roles as wives. The regulations on ordination and ministry in the second section place similar restrictions on women in their ecclesiastical roles as widows and virgins. “And when she sees anything that is hateful, or hears it, let her be as though she saw and heard it not. Indeed, a widow should care for nothing else except this, to pray for those who give, and for the whole church. And when she is asked regarding an affair by anyone, let her not too quickly give an answer, except only about righteousness and faith in God ” (XV). “Indeed, when the Gentiles, those who are being instructed, hear the Word of God spoken not firmly, as it ought to be, unto edification of life everlasting—and especially because it is spoken to them by a women—about how our Lord clothed Himself in the body, and about the passion of Christ, they will deride and mock, instead of praising the word of doctrine. And she shall be guilty of a hard judgment for sin ” (XV). That widows were involved in preaching and teaching seems clear from the context. It is precisely such activities that created the conflict. Another fascinating restriction placed on widows in this portion of the Didascalia is that they are forbidden to speak with other members of the Christian community. Widows who visited in the homes of other believers were suspected of stirring up controversy and forming factions by their teaching and involvement. Their financial autonomy with respect to the bishop precipitated the accusations both of insolence and greed. They were called immodest simply because they were “roaming about ” in public. The profile of the good widow is sketched in another section. She remains in her house praying day and night. Her eyes are pure and her ears are holy, implying that she is not defiled by reports of scandals. Her feet walk in the way of peace, meaning she is not involved in controversies. In her mouth are no lies, indicating she is not teaching. Widows in the Didascalia are restricted to praying at home because their teaching activities among fellow believers lead to factions and controversies. The picture of the activities of widows emerging from this church order is impressive indeed—not only preaching and teaching the pagans Christian truth, but also visiting the homes of believers for the purpose of instruction in Christian doctrine. These activities clearly generated conflict in the church. But it is important to be quite precise in determining the nature of this conflict. Why were widows not just forbidden to teach, but restricted to their homes? Let us compare the regulations governing wives with those governing widows. In the first section of the Didascalia, the Christian wife is contrasted with the wicked woman, who moves freely about the streets of the city seeking men to seduce (III). The Christian wife, on the other hand, does not wear makeup, nor fine fabrics, nor designer sandals; rather she obeys her husband and does not appear in public. Restrictions placed on Christian women are no different from those placed on women of the upper classes by Hellenistic society. A Pythagorean treatise on chastity affirms that “a woman’s greatest virtue is chastity. Because of this quality she is able to honor and cherish her own particular husband. ” Chastity, in this treatise, is a composite virtue and to possess this virtue a woman must fulfill five qualifications for chastity. The first is preserving the sanctity of the marriage bed. The second is to preserve the cleanliness of her body. The third, fourth and fifth qualifications concern “the manner in which she refuses to leave the house. ” A major part of the virtue of chastity is how and when a woman appears in public. This pagan standard for upper-class women, applied in the first section of the Didascalia to women in their social roles, is then applied in the second section—which contains rules for church offices—to women in their ecclesiastical roles. The Statutes of the Apostles, a church order of the early 4th century, indicates that the problem of women’s leadership has shifted from the ministry of the widows to the ministry of female deacons. Only three widows were to be ordained—two to function as intercessors and one to minister to women when they were sick and confined to their homes. The ministry of male and female deacons was primarily the ministry of good works, but they also assisted in the eucharistic ministry. This is the focal point of controversy. Clearly the precedent claimed for this minor role for women in the eucharistic service had been the natural assumption that the women had waited on Jesus and His disciples and served them at the Last Supper. But the apostolic sayings make clear that the Last Supper was an exception in this regard and the women were not present even as servers. The social explanation for this is reflected in Martha’s saying that Mary laughed—it is because women lack the necessary seriousness that they were excluded. Mary’s remonstration goes back to the theological point that according to the teaching of Christ the weak (women) should be healed by the strong (men administering the eucharist). In these apostolic sayings we see the primarily social reasons given for excluding women from a minor role in the eucharistic service. This exclusion of women from participation in the Eucharistic ministry has the flavor of an innovation. The elaborate defense of the practice is followed by the rather poignant question of James, “How can we find for the women any ministry? ” To which the church lamely replies, “Well, they can exercise the ministry of good works. ” It is interesting to note that the problem of women’s ministries, in light of the restrictions placed on their activities, has become so acute that this church order addresses it directly: What ministries are appropriate for women? The tone of the church order implies that no satisfactory answer had been found. The last two church orders we will consider are the Octateuch of Clement and the Testament of Our Lord, both dated in the early 5th century. In these church orders, we see a resolution of the problem of finding a ministry for women. For here we find widows assigned many of the activities that were denied them by the earlier orders. The widows are to exercise a disciplinary function; they are to exhort the women who are disobedient. The women characterized as disobedient were evidently leaders of factions, and teachers in this capacity; for it is said of them that what they put forward is just a lot of talk and nonsense. Furthermore, they are to bring sinful women to repentance and teach them modesty. The widows are also entrusted with a teaching office. They are to instruct the ignorant (which most likely refers to pagan women), and they are also to teach the female catechumens. They are to visit the homes of other believers, provide for the sick, and support the needy. There is, however, one restriction placed on women in these ministries—an issue is not made of it, but it is assumed—that all of these ministries are to be exclusively exercised toward other women. These two church orders are remarkable for the tenor of the passages dealing with women’s ministries. The concern of these church orders is not to limit or restrict women’s ministries, but rather to provide women with specific ministries. We sense no controversy here. The church was comfortable with the notion of women exercising the entire range of ministries, as long as they didn’t minister to men. What can we learn about the leadership of women from these documents? Since there are no controversies over the leadership of women in the church orders of the 2nd and early 3rd centuries (the Didache and the Apostolic Tradition), we learn nothing about women’s ministries in this period. One might conclude from this evidence that women did not exercise any leadership function until the 3rd century. However, recent scholarship (E. Fiorenza, B. Brooten, D. Irvin, F. Klawiter) renders such a thesis highly improbable. From the middle of the 3rd century on, the controversies over women’s ministries in the church orders teach us much about women’s leadership. Women were evangelizing, baptizing, teaching, interpreting Scripture, doing visitation, functioning as leaders of groups within the church and speaking out in the assembly. The Statutes of the Apostles show that women also shared in the eucharistic ministry. The church orders from the middle of the 3rd century and following also make clear that these ministries on the part of women generated conflict—conflict that resulted from a sense that such activity was inappropriate for women when measured by the standards of Greco-Roman society. The Didache expresses the concern that women who minister seem immodest or unchaste. The Statutes of the Apostles find women lacking in seriousness and dignity when sharing in the eucharistic ministry. The Octateuch of Clement and the Testament of Our Lord have no problem with women’s ministries, so long as they are directed exclusively to other women. It is interesting to note that each of the church orders attempts to resolve this conflict by restricting women to the private sphere. The widows of the Didascalia (like the wives) are to stay at home and pray. The Statutes of the Apostles offer women the ministry of good works, which is practiced in private. The Octateuch of Clement and the Testament of Our Lord restore all the lost ministries to women, but they are to be exercised only in the women’s quarters. That is a ministry to women and in principle not a public ministry. In each case the attempt to resolve the conflict generated by women’s ministries is an attempt to restrict them to the private sphere. If, as the evidence seems to indicate, the reasons for the exclusion of women from church offices were primarily societal—that is, that their activities in the church brought them into conflict with the norms of Hellenistic society—then we find ourselves in the odd predicament of having to explain not why women were excluded from church offices, but why they were free to exercise ministries up until the 3rd century. Since Hellenistic norms for the behavior of women remained relatively stable throughout these five centuries, what we need is an explanation for why women’s ministries did not come into conflict with these norms in the first two centuries. What we are looking for is some fundamental change in the character of the church occurring around the middle of the 3rd century. The early Christian community understood itself to be creating a new social order where family bonds were extended to include the whole “household of faith. ” The titles “sister ” and “brother ” express the familial nature of this new community. Their forms of worship grew out of the family liturgies of the Jewish world. Leadership roles were modeled on the household roles of disciplining, disciplin, teaching and providing. These were all functions of the mistress of an extended household. At this stage Christian worship took place in the private sphere—the sphere of the household. The activities and ministries of women generally took place within the accepted roles and legitimate identity of women in the private sphere of the household. This had two consequences. Because women played a powerful role in the household of the Greco-Roman, it would have been natural for them to assume functions within the house church that they already exercised in their households. Second, because Christian worship took place in the private sphere, women were not subject to the norms that limited the activities of women in the public sphere. But in the 3rd century, Christianity began to constitute itself as a public sphere. We see this in a number of ways. Christian worship moved out of homes into buildings that were devoted exclusively to the needs of the worshipping community. The common meal was dropped. Rituals became more elaborate. In the early part of the 3rd century, offices of the church were institutionalized through a rite of ordination and, by the end of the 3rd century, through a distinctive garment. The sphere of Christian worship was becoming a public sphere. Women’s leadership in the 1st and 2nd centuries would have been exercised in the private sphere, which is the sphere of the household. In this sphere there were no limitations placed on women. Women would have continued exercising these ministries in the 3rd and 4th centuries as well. But around the middle of the 3rd century, Christian worship began to be perceived as taking place in the public sphere. Women no doubt continued exercising the ministries they had in the 1st and 2nd centuries, but suddenly their ministries were controversial primarily because Hellenistic women were not allowed to exercise authority in the public sphere. What follows is a century of conflict over women’s roles until the ministry of women is restored again in the private sphere. But the church by that time had gone public. Dr. Karen J. Torjesen is an assistant professor of early Christianity and women’s studies at Claremont Gradual School in Claremont, Calif. She has written a book on Origen’s writings, plus numerous other articles for magazines and journals.